With its toy soldiers, rubber ducks and teddy bears, Jesse Lewis' gravesite is "like a party," says his mother, Scarlett Lewis. He is buried at Zoar Ridge Cemetery in Newtown, Conn.
NEWTOWN, Conn. — There are the balloons that suddenly appear everywhere on children's birthdays — red for Avielle, green for Ben, Mylar ducks for Jesse. There are the young voices raised in song, the teenagers returning to Friday night football games, the number 26 peeking out from doorways and shop windows, a father's sax solo in memory of his spirited Ana. A year later, a year after the shooting rampage at Sandy Hook Elementary, this is a town that has learned to live again. Many have started foundations in the names of their kids. The purposes are as diverse as the first-graders themselves. They aim to help animals, to improve autism education, to advocate for the arts, to study connections between mental illness and violence, to promote kindness, and much more. "Doing something for somebody else is so healing, and that's what I feel like I'm doing with my foundation," said Scarlett Lewis, who created the Jesse Lewis Choose Love Foundation in memory of her 6-year-old. The desire to help others isn't unusual after great loss, but Newtown's affluence and sense of community amplify the effectiveness. In this town 75 miles from New York City, parents are scientists, educators, family therapists and company executives who have the work experience and wherewithal to see big plans through. "It's absolutely stunning to me, the breadth of the funds and foundations created to focus on making change and making society a better, safer place for all people," said E. Patricia Llodra, the town's top public official. "We're not going to be known as a place where this horrible thing happened; we're going to be known as a place where a horrible thing happened that was turned into some great thing. … We are intentionally moving toward goodness." David Wheeler, father of Ben, put it more simply: "We have to make a world we can live in." Scarlett Lewis surrounds herself with items that remind her of Jesse. These are the boots Jesse Lewis wore summer and winter. 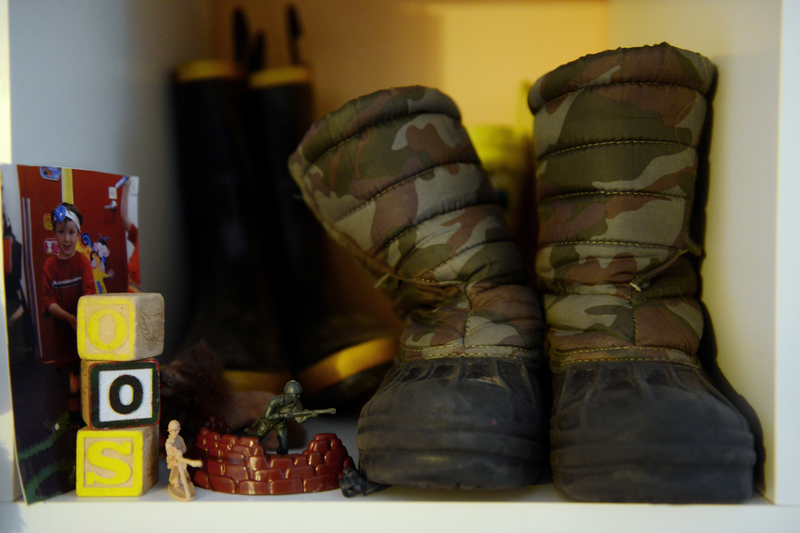 Those, along with his toy soldiers, are among his mother's treasured mementos. 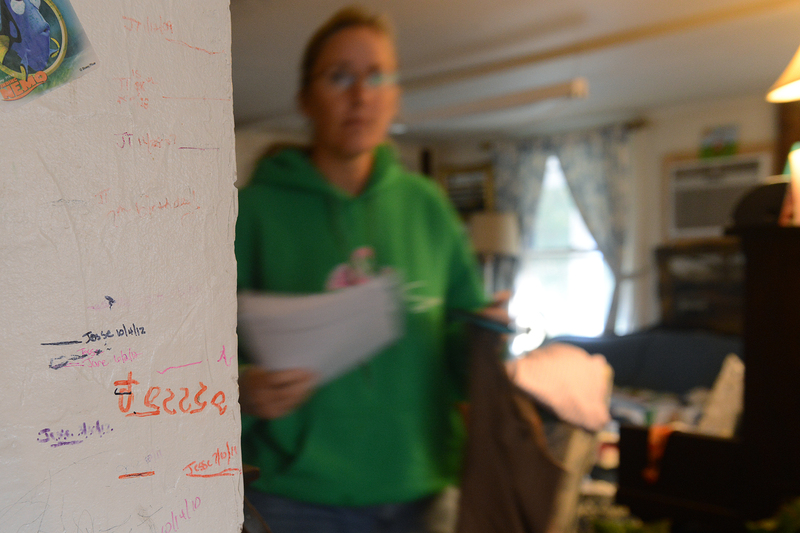 Scarlett Lewis marked the growth of her sons and other visitors on her kitchen wall at her home in Sandy Hook. Her younger son Jesse's last mark was made Oct. 4, 2012, two months before he was killed. Paintings of J.T. 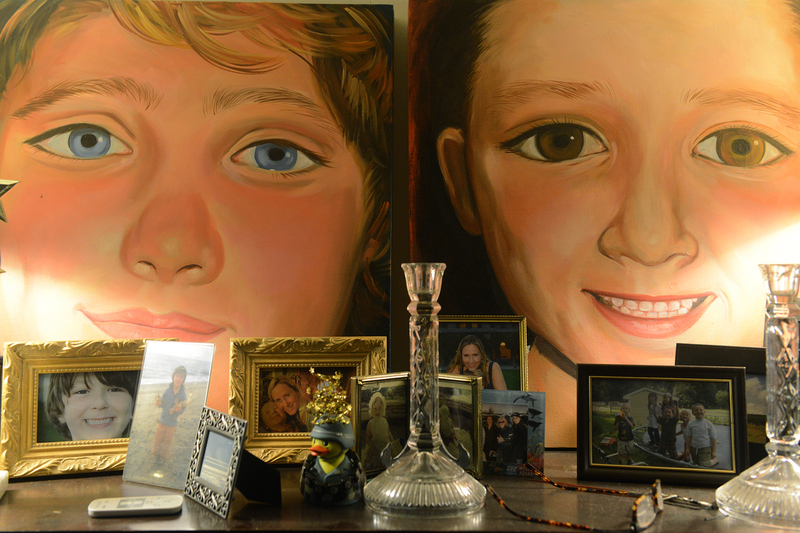 and Jesse Lewis, made by their mother, are on display along with other family portraits and mementos. Jesse Lewis was a human juxtaposition in a 71-pound body. He was a rambunctious boy who gusted into rooms like a hurricane then settled himself into a quiet corner to read books about birding. In summer, he would fill one pocket with delicate shells he collected on Long Island Sound and the other with found wine corks, which he called "corkles." He loved yellow rubber ducks as much as his green Army men he carried around in a Spider-Man lunch box. At bath time, he would line them up around the rim of the tub, fierce warriors and gentle birds in formation. "He had those two parts to his personality — very sweet and cuddly and loving but also tough like a little soldier," said his mother, Scarlett Lewis, a former bond trader now running a small farm, who is a bit of a juxtaposition herself. He would put on a green helmet and camouflage snow boots — no matter the weather — and cast a long shadow as he patrolled the perimeter of his family's farm. Then at night he would crawl into bed next to his Mama, a wee boy seeking comfort and a bedtime story. After Jesse was killed, Ms. Lewis couldn't bear to be in her own house. She stayed away for weeks except to gather clothes for her son's funeral. She returned for good only after family friends promised to clear out the toys, the boots, the lunch box, the crayon drawings of Star Wars figures, the school papers, the toothbrush — every trace of Jesse. Only then, she thought, could she come home. "I didn't want to walk in that door and have his boots and have his coat and all of his stuff around. I can't have that," she remembers thinking. That changed the moment she returned and felt an overwhelming emptiness that she has since filled from floor to ceiling with everything Jesse loved. "Now I want him all over and — you can see — he is all over and he will always be all over," she said. "You change your mind." His backpack now hangs from a bookshelf and his little ducks line the fireplace mantle. Covering the living room walls are paintings of Jesse and his 13-year-old brother, J.T. — some painted by their mother, and the rest mailed from around the world by strangers who also sent hundreds of thousands of cards, letters, teddy bears, handmade quilts and prayer shawls. Now she and J.T. are on a mission to return that kind of compassion to the world through words and actions inspired by three words — "norurting, heling, love" — Jesse scrawled on a chalkboard in the farmhouse kitchen in the days before he died. That is: Nurturing, healing, love. Those aren't part of a typical first-grader vernacular and not something Ms. Lewis remembers saying around the house. "It's like not of this world. He wrote that — it is my belief — because, spiritually, he had a knowing of the fact he wasn't going to be around very much longer and he wanted to leave that message of comfort. I knew it was a message of inspiration for the world," Ms. Lewis said. And so it became the core of her mission and the title of her book published in October to honor her son's memory. "I may not have known what my purpose was before … and now I feel like I am 100 percent sure and I feel very blessed about that. My purpose is to spread Jesse's chalkboard message of nurturing, healing love," she said. "I wrote it because I felt like the nation went through this with me and I wanted to give back and to tell people how I was, what I've learned, and to share these incredible miraculous messages that Jesse has given me." All proceeds from book sales are going to the Jesse Lewis Choose Love Foundation, which is developing school-based education programs to transform the culture of violence into one of safety. Part of its mission is to ask people to change one angry thought every day into a compassionate one. "In doing so you'll make yourself happier, you'll make those around you happier and — through the ripple effect — you'll make the world a more peaceful place," Ms. Lewis said. "This whole tragedy began with an angry thought, and an angry thought can be changed." She's finding room even to forgive the killer, Adam Lanza, and his mother, Nancy. Lanza, 20, murdered his 52-year-old mother at their Newtown home before heading to the school that day where he killed 26 others then took his own life. But few in town see Mrs. Lanza as a victim. Many blame her for keeping guns in a home she shared with a son known to be troubled. "As a single mom, I feel compassion for her, however the choices she made were not loving," Ms. Lewis said. "I want to be in judgment of no one, and I don't know the whole story, but her mistakes led to something very tragic." Still, Ms. Lewis made sure to place 28 ceramic stars around her son's grave at Zoar Ridge Cemetery, not 26 like so many other memorials around town. Jesse's brother J.T. also has a mission. His began the night several Rwandan genocide survivors and their translator reached out from 7,000 miles away. In a video conversation over Skype, they told J.T. they had experienced tremendous and violent loss, too, but managed to move forward. One had sent himself to college and others said they longed to do the same. That conversation gave J.T. a purpose. He began writing his plan that night in his journal. People around the world had been asking how they could help J.T. Now he knew what to tell them. Within weeks he and two friends had raised $1,600 — enough to pay for a year of college in Rwanda. Via Skype, J.T. delivered the news himself to the 27-year-old recipient, a woman who had been orphaned at age 7. She clutched her face and cried when an interpreter told her of the gift, and J.T. looked happier than his mother had seen him since the shooting. "He started healing that day," Ms. Lewis said. "Being in service to somebody — doing something for somebody else — that's really the meaning, to me, of choosing love." David and Francine Wheeler with their son Nate, 10. Kaitlin Roig-DeBellis successfully hid her first-grade class in a bathroom. Showered afterward with expressions of kindness, she now travels the country to speak about her experiences and is determined to "pay it forward." 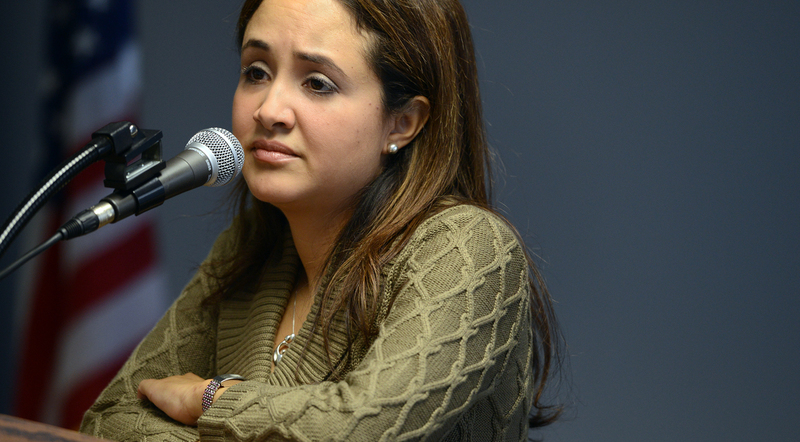 Nelba Marquez-Greene, a marriage and family therapist, speaks at the Stop the Violence Conference at Central Connecticut State University. Her daughter, Ana Grace, was killed at Sandy Hook Elementary School. In the days after the shooting, Rick Haylon, a Trinity Episcopal Church lay leader, thought of a way to honor Benjamin Wheeler, who had been a member of the congregation. He would get other church members to volunteer and he would call it Ben's Lighthouse, a name that makes the Wheeler family smile. Their son wanted to be a lighthouse keeper and an architect. "When you think about it, lighthouses show us the light and keep us from harm," said Francine Wheeler, who often dreams about her younger son and sometimes feels as though he is guiding the nonprofit's work and helping to build it up like an architect would. That's what organizers thought about as they constructed a 20-foot model lighthouse that would become the centerpiece for a June festival filled with lighthouse-themed games, artwork, crafts and entertainment for the town's children. "We want surviving children to have positive things to do. They're going to need support for years and years and years," Mrs. Wheeler said. She and husband, David, help guide the foundation, and their 10-year-old son, Nate, is among the many volunteers. Mr. Haylon saw the lighthouse festival — six months and a day after the shooting — as a turning point in the town's healing. "There was a cloud hanging over all of us. I think the festival was a seminal point when things started to change," he said. "We wanted to create smiles and we did so beyond your wildest dreams." The goal, he said, is to overwhelm the community with opportunities to create joyful memories. "We want a kid to grow up not remembering [the shooting] as the defining moment of their lives but to have multiple defining moments, the vast majority of which are happy," Mr. Haylon said. But Ben's Lighthouse, which is funded through private donations, is about more than fun. It's also about finding and helping others. It raised money to send 19 local teenagers to Moore, Okla., in the spring to help the tornado-ravaged town recover. Part of their mission was to comfort families whose children died when their school collapsed on top of them. The comforting, though, went both ways. "There were a lot of tears shed and a lot of hugging going on," said Mr. Haylon, who joined them as a chaperone. "Some [of the Newtown kids] said, ‘Before this trip I didn't know how to talk about Sandy Hook, and I didn't even know I needed to. Now I can and I will.' "
When the shooting started, Kaitlin Roig-DeBellis hustled her 15 first-graders into a bathroom so small that she still can't believe they all fit inside. They huddled in horror and listened to a massacre, then huddled some more, afraid to open the door even after police arrived. The world opened hearts and wallets to these children, sending cards, money for pizza parties, and care packages filled with stuffed animals, toys and sweets. Every day there was more. "We were getting, getting getting," Ms. Roig-DeBellis said. "I thought enough is enough. We've gotten and gotten and now it's our turn to pay it forward." The idea came on a January afternoon as her students opened a box filled with coloring books, paints, stickers, puzzles, juice boxes and cookies. The children concluded that the sender — like so many others — wanted to be kind and wanted them to be happy. "I said, ‘You're absolutely correct, and did you know that in life, when somebody does something nice for you or makes you feel happy, then you have to do the same? So we need to make someone feel happy and we need to help someone,' " Ms. Roig-DeBellis remembers. "Immediately their hands shot up and they said, ‘Who are we going to help?' and ‘How are we going to help them?' "
She learned of a new teacher in Tennessee who wanted an interactive white board. The Sandy Hook class decided to buy it for her, and that turned out to be only the start of Classes 4 Classes, a project that has since provided world history textbooks, iPads, whiteboards and more for 14 classrooms — and counting — throughout the country. Students and teachers identify projects they would like to help another class with — from buying classroom equipment to funding field trips. Then they create a Web page for the project and invite people to contribute $1 or more. Some classes have had fundraisers such as tag sales, at which children sell their old toys. The teachers, meanwhile, incorporate lessons about kindness and giving into their lesson plans and post student work on the website. "It's not really about the gifts at all that's of the utmost importance. It's kids being involved and interested in a project that's all about giving to someone else. It's all about learning to be empathetic to the needs of someone else," Ms. Roig-DeBellis said. "It's all about learning to be caring and kind and compassionate." She is taking time off to promote her nonprofit, but plans to return to teach in Newtown next year. For now, her work is all-encompassing as she flies from one end of the country to the other to talk about Classes 4 Classes and to speak to other educators about what she experienced. Those talks have included trips to Oregon, California, Texas and Pennsylvania, where recently spoke to Seneca Valley teachers in Butler County and New Castle teachers in Lawrence County. She has been open about what she saw and felt and did on the worst day of her life. There's not a question she won't answer. "I feel like I owe it to people who can benefit from my experience," she said. "I'm simply a person sharing my story and saying you can go through hell and come out the other side." "Everyone has really bad things that happen to them in life, whether it's losing a loved one, whether it's being diagnosed with cancer, whether it's a terrible car accident. We all go through trauma," she said, "but you can always choose to have hope." On Dec. 14, 2012, marriage and family therapist Nelba Marquez-Greene was coordinating an adolescent outpatient psychiatric clinic in New Britain, Conn., when Adam Lanza opened fire inside her children's school 40 miles away. Ten months later she was back in New Britain, speaking this time to a group of educators at a conference on school safety coordinated by the Capitol Region Education Council, where she used to work. She was so familiar with members of the audience that she pictured herself among them, not at the podium talking as the parent of a 6-year-old murdered in a school bathroom and a 9-year-old who hid in a classroom to keep safe. Instead, she was a grieving mother with a message. She called for a public awareness campaign to teach the signs of mental illness, to steer people toward treatment and to reduce stigmas that discourage people from getting help. She bristles when she hears people use dehumanizing terms such as "monster" to describe troubled and mentally ill people. "The truth is [Lanza] killed my daughter and something in that home went terribly wrong, but to call him a monster absolves me of my responsibility to see him as human and absolves him of taking responsibility for his actions. Monsters can't be helped. Monsters cannot change, but people can," Mrs. Marquez-Greene said as she addressed 150 educators on a brisk October morning. "If we go into this conversation about healthier families, stronger communities and safer schools with this kind of labeling … we have already lost." As he works to make a difference, her husband, saxophonist Jimmy Greene, is driven to tell his daughter's story through music. Jimmy Greene plays "Ana's Way," a song he composed in honor of his daughter. He recently composed "Ana's Way," a soulful song with a bossa nova rhythm and lyrics that describe his daughter's big eyes, her beautiful laugh, her joyful life and her prayerful ways. Ana wouldn't have liked it, Mr. Greene said, laughing, as he recalled his daughter who loved to dance and seemed to be in constant motion. "She probably would have said, ‘Daddy, this needs to be faster.' "
For weeks after Ana's death, he couldn't bear to make music, even though it's something he has done all his life, but then he picked up his instrument again. "The more I practiced and the more I played I felt like I was able to be more myself and to express myself … when words were insufficient," said Mr. Greene, an assistant professor of music at Western Connecticut State University. Last weekend, the Greenes brought together his musical talents and her background in mental health to host a daylong conference at the University of Hartford called "Love Wins! Promoting Love, Connection and Community for Every Child." It was the inaugural event of The Ana Grace Project, a foundation created to honor the way their daughter lived. Bruce Perry, a prominent researchers on the effects of trauma on children, gave the keynote address. He and other mental health experts advocated for violence prevention and discussed the costs of unmet mental health needs in cities. Musicians offered entertainment between sessions. They included the Greenes' son Isaiah on piano and a group of Connecticut jazz artists who played original compositions from Mr. Greene's forthcoming album "Beautiful Life," which includes his new song about Ana. "We wanted people to talk about the issues in hopes that it will leave a lasting impression and that they will bring it into their work, their clinics, their agencies and their private practice so that in small ways the conversations continue," Mr. Greene said. Newtown Youth Voices singers rehearse "My Beautiful Town," composed by their director, Jim Allyn. Michael Baroody and Annette Sullivan. Mr. Greene isn't the only one searching for healing through music. Just ask the 15 singers and young violinist who rehearse between stained-glass windows in Newtown Congregational Church. Many had been students of Francine Wheeler, a voice and piano teacher who took an extended break after her son Ben's death. She returned to teaching a few months ago but reduced her student load from 38 to about 20. Her students are singing again and trying to bring music back to the Wheeler family and to the rest of their town. Jim Allyn, another local music teacher, brought them together with some of his own students to record "My Beautiful Town," a piece he had written in his den seven days after the shooting and four days before Christmas. "It was utterly heartbreaking and surreal to be hearing Christmas music after what we had been through but at the same time we needed to sing. We wanted it to be all right to sing." he said. "There's something about being able to approach an incomprehensible loss and somehow creating a work of art that people can share and relate to the loss collectively. It brings order." Initially he had no long-term plans but the children, ages 8 to 18, had bonded and didn't want to stop making music together. Now they rehearse regularly and plan to perform together at least once a year as Newtown Youth Voices. "We're kind of like a family now because we've been through a lot together," said Sophie Kennen, 15. If the survivors had visible scars, Michael Baroody would have known what to do. If horseback riding lessons alone would have helped the children of Sandy Hook, Annette Sullivan would have met the challenge. Instead, both saw needs where they had no skills. That didn't stop either of them. "The only way through this was to feel strength again, … to do things you never thought you could do," said Dr. Baroody, a plastic surgeon. "We wanted to show kids that this [shooting] wasn't going to keep them from doing things. They weren't going to grow up saying, ‘I didn't achieve anything in life because I'm from Newtown where this horrible thing happened.' "
Although he isn't a performer, he knew theater is magical. Maybe it could transform a deeply wounded community. At Zoar Ridge Stables, Annette Sullivan noticed that young visitors affected by the tragedy were letting down their guard during riding lessons and at the birthday parties often held there. "Overhearing how frightened they were, where they were and what they heard — it was very, very difficult to hear," said Mrs. Sullivan. "If this was going to be a place [where] they felt they could open up, there should be someone professional to help them," she decided. "Horses are my thing, but it took a new way of thinking to realize I could do something," she said during a recent interview on her farm. Dr. Baroody and Mrs. Sullivan don't know each other, but both emerged from the fog of Dec. 14 determined to fill whatever needs they saw, even those that would draw on skills outside their areas of expertise. She created the nonprofit Embrace Hope Foundation and hired a team of mental health professionals to offer equine therapy. Meanwhile, Dr. Baroody called upon Broadway directors, experienced choreographers, professional musicians and stagecraft experts. All came together to help 84 children put on the biggest, most elaborate and best-attended theatrical event in town history. "Seussical" cast and crew members, front from left, are Ava Baroody, 7, and Jane Shearin, 10. Back from left are Kevin Liniger, 17, C.J. Landgrebe, 16, and Kirsten Liniger, 17. 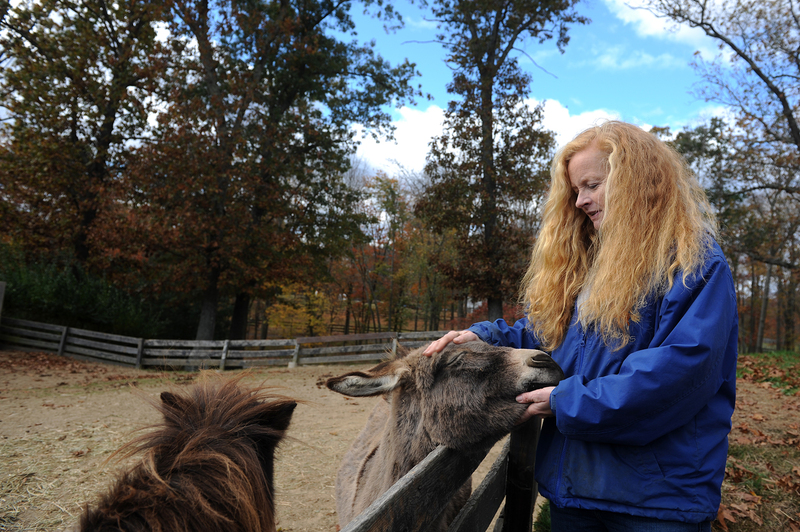 Annette Sullivan is at Zoar Ridge Stables with the pony, Turquoise, and donkey, Chocolate, that belonged to Jesse Lewis, one of the Sandy Hook victims. 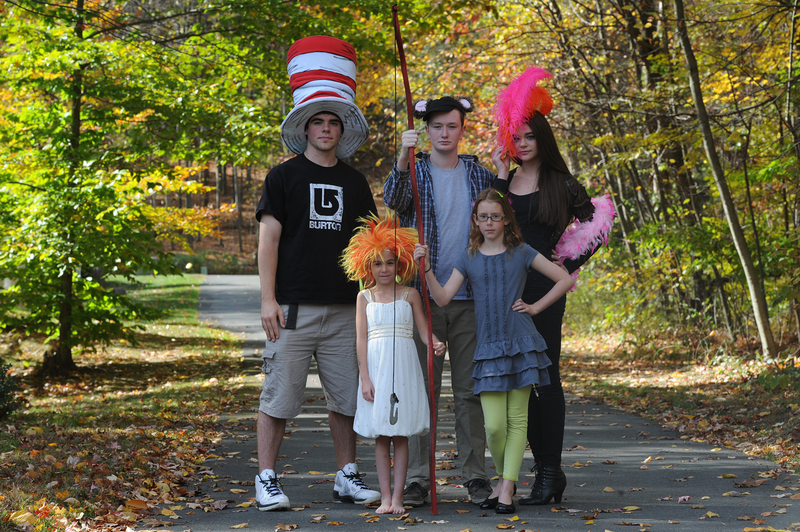 He incorporated his group as the 12.14 Foundation and arranged to stage "Seussical," not as a distraction from pain but as a way to work through it. "Performing arts is the tool we are using to get through this because there is nothing really verbal to be said. It had to be expressed another way," Dr. Baroody said. "I never dreamed of ever wanting to do anything like this, but it had to be done." The young cast rehearsed nine hours a day, six days a week for five weeks. Their labors culminated in four sold-out shows on the stage at Newtown High School, where seven months earlier President Barack Obama offered tearful condolences, noting that no words could ever match the depths of Newtown's sorrow. Musical comedy, though, could help. The community would find that out in August when 10-year-old Jane Shearin, as Jojo, stepped onstage to open the show. "I really wanted to bring hope to Newtown. I love Newtown and I love theater, so I had something I loved to do that could also bring hope to our community," Jane said in a recent interview. "It brought a lot of happiness. It helped me deal with" the shooting, she said. "When everyone around us was focusing on sadness and tragedy, ‘Seussical,' for me, really helped." When the curtain parted, the stage exploded with colorful lights, fantastical sets, bright music and — best of all — cheerful, confident children, Dr. Baroody said. "People in the audience who knew these kids hadn't seen them like that for a long time. They were speechless. They just couldn't even talk. It was so emotional for the audience," he said. Across town at Zoar Ridge, the equine therapeutic efforts are helped by a menagerie of horses with names like Betty, Magic and Merlin, plus a donkey named Chocolate and a pony named Turquoise that had belonged to 6-year-old Jesse Lewis, who lived nearby on a small family farm and had been a frequent visitor to Zoar Ridge. Jesse's classmate Avielle Richman, who also was killed at Sandy Hook, was a regular there, too. She spent much of the last year of her life at the stables, grooming horses, learning to ride and brightening up the farm with an infectious smile and fearless attitude. "She was the most joyful child," Mrs. Sullivan said. "She was happy for happy's sake." It was the memory of Avielle that moved Mrs. Sullivan to create the therapy program. It was too late to help the curly-topped angel, but Avielle's friends still needed plenty of help. Mrs. Sullivan had met many of them at Avielle's birthday party held at the stables just two months before the shooting. 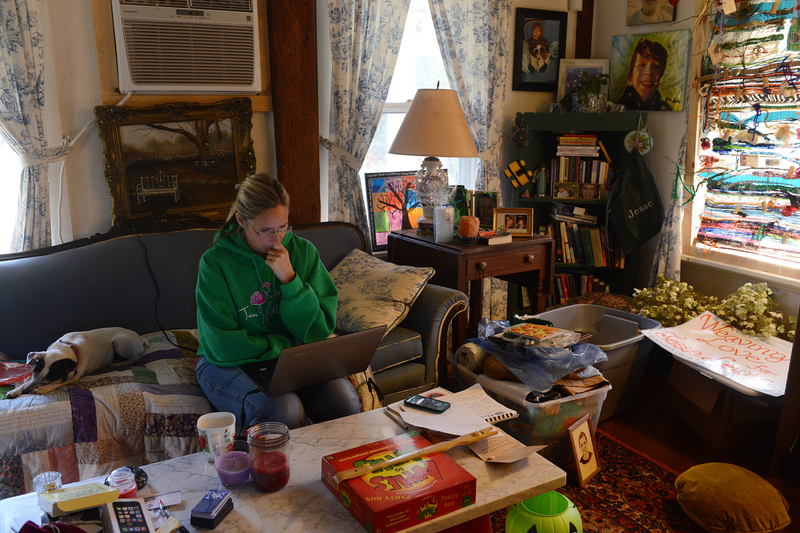 "I want to make her friends happy again," Mrs. Sullivan said on a recent morning in her barn's tack room, where photos of Sandy Hook children outnumber saddles that hang beneath a wooden sign that reads, "Angels are all around us." "There are days when I don't know if I'm strong enough to look into one more sorrowful face," Mrs. Sullivan said. It's on those days that she turns to the image above her desk of Avielle riding Betty. "I look at her picture because the smile is still there. Her eyes still sparkle," she said. The intersection of Washington Avenue at Church Hill Road in Sandy Hook. The Sandy Hook Volunteer Fire Company has 26 stars on its roof to commemorate the lives lost at Sandy Hook Elementary School. An outsider driving through Newtown these days might assume the numerical address of every house is the same: 26. But the numbers painted on curbs and stenciled onto mailboxes aren't house numbers at all. They are subtle reminders of the lives lost at Sandy Hook Elementary School — 20 children and 6 educators. The grand roadside tributes — 26 plywood angels at one intersection, 26 roses at another, 26 candles lining a driveway — are gone now, as are the towering piles of teddy bears -- all taken away and turned into what town leaders call "sacred soil." Fewer people are wearing the once ubiquitous rubber "Sandy Hook — Never Forget" bracelets, but small tributes and remembrances are still there. They are on high school football helmets and on the signs that first appeared in shop windows in the days after the shooting and remain there now: "We are Sandy Hook. We choose love." The most prominent symbols are the 26 red stars on top of the fire house, where families had spent a full day alternating between hope and despair as they waited for the terrible news that eventually would come. 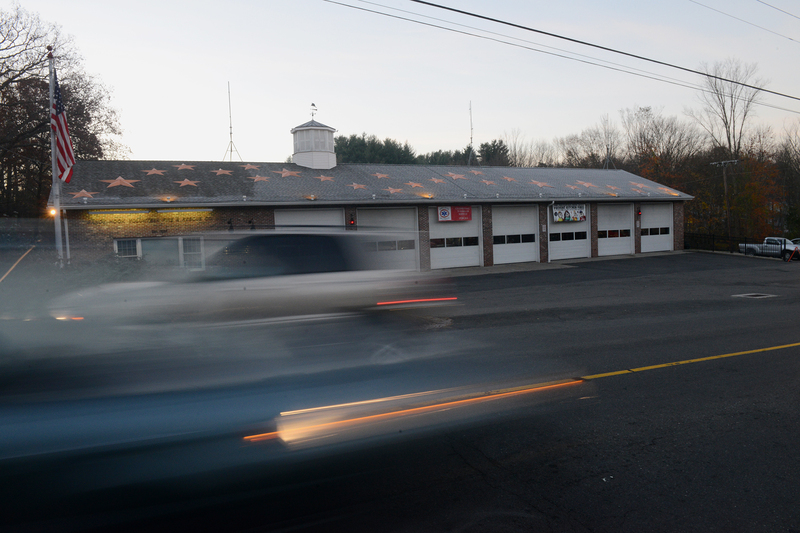 Newtown will never be the same place it was before that day, but neither is it the one it became in the days and weeks that followed when townspeople walked in a fog, made a point to attend church and dreaded opening mailboxes to find Christmas cards — mailed before Dec. 14 — with pictures of neighbors' dead children. 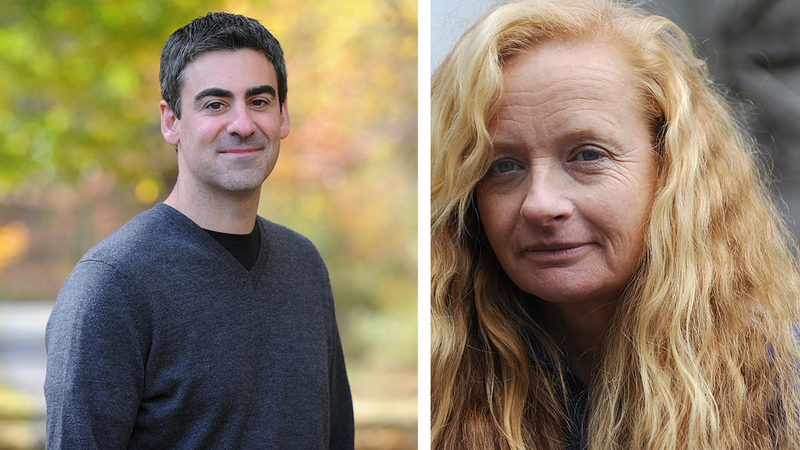 "It's important for a community, at some point, to pivot from their trauma and despair and toward healing and a sense of shared aspirations for moving forward," said Rich Harwood of Bethesda, Md., an expert in helping communities through crisis. Newtown is doing that, he said. The town hired him to help it decide the fate of Sandy Hook Elementary School. Teachers said they could never imagine going back there, while others said there was no reason to replace a structurally sound building when renovation would do. Mr. Harwood conducted a series of community meetings that helped a task force of leaders reach the unanimous decision to demolish the school and rebuild on the same site. The work began in October behind black fencing erected to keep prying eyes away. Plenty of townspeople disagree with the decision rendered last spring, but it no longer dominates conversations at Caraluzzi Market, at Village Perks coffee shop or at high school football games, where the crowd cheers for the marching band as enthusiastically as it does for a touchdown pass. From outward appearances, this could be any town. But it isn't. This is Newtown, and its residents are anticipating the one-year anniversary of the worst day in town history — a day local officials have designated for private remembrance, not public ceremonies and certainly not for the pro-gun rally that activists planned for the 14th but, after backlash, agreed to move to the 15th. Mrs. Roig-DeBellis, the first-grade teacher, said she can't imagine how the day of the anniversary could be harder than the 364 that came before it. "Every day is ridiculously hard. It's not like Dec. 14 I'm going to wake up and remember. I remember it constantly," she said. "Every day is hard." The town's top official, Mrs. Llodra, is trying to keep her town focused on healing. "Right after the horrible thing happened, we didn't talk about anger. We didn't talk about the evil that happened to us. We didn't talk about hating someone who harmed us," she said. "We put our arms around each other and figured out how to manage this thing that happened to us so we don't lose our personal goodness." Tracie Mauriello is the Post-Gazette’s national reporter based in Washington, D.C. Within hours of the shooting at Sandy Hook Elementary School she was on a flight to Connecticut to cover the horrific event and its aftermath. She grew up in Oakville, Conn., 16 miles from Sandy Hook, and spent a year covering Southbury, Newtown’s eastern neighbor, for the Republican-American newspaper in Waterbury. Tracie has worked for the Post-Gazette since 2005. Rebecca Droke is a native of Arlington, Va. She graduated from Ohio University in 2005 with a degree in visual communication. After working at The Durango Herald in Durango, Colo., for a year, she joined the staff of the Post-Gazette in 2006.